At the plastics trade fair in Düsseldorf, the Infrastructure Division of battenfeld-cincinnati, Bad Oeynhausen/Vienna, is launching a new machine series, the GL version of the proven solEX high-performance single-screw extruder series. 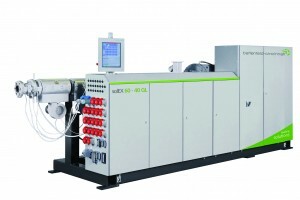 Thanks to their alternative drive concept, the new models optimally meet the market demand for high energy efficiency. At the last K 3 years ago, battenfeld-cincinnati presented the solEX high-performance extruder series for the production of PE-HD and PP pipes and corrugated pipes as a result of the positive coopera-tion between the two extruder manufacturers. Thanks to their 40 D processing length, these single-screw extruder models, featuring high throughputs and optimal melt homogeneity at low melt tem-peratures, have been appreciated by plastics processors worldwide ever since. The new solEX GL series (GL stands for “gearless”) distinguishes itself from the familiar series by a new drive system. It consists of a high-torque motor which offers a higher degree of energy effi-ciency compared to the motor-drive combination used so far. Other benefits of the new drive concept are operation with low noise and vibration levels, and virtually no maintenance requirements. Through dispensing with the gearbox, the extruder’s footprint has become even more compact, so that it combines high performance with very modest space requirements. Of course, the four extruders of the GL series, which come in the sizes of 45, 60, 75 and 90, also offer all the features that are present in their sister series. They ensure excellent product quality with low energy input and stand out by their favorable capital-output ratio.